KGB chief's journal reveals fate of Swedish diplomat instrumental in saving thousands of Jews from Holocaust. JTA - Raoul Wallenberg, the Swedish diplomat who saved thousands of Hungarian Jews from the Nazi gas chambers, was executed in a Soviet prison, according to a KGB head’s diaries. The diaries of Ivan A. Serov, who ran the former Russian secret police and intelligence agency from 1954 to 1958, were discovered inside the walls of his second home in northwestern Moscow, which his granddaughter is now renovating. Discovered four years ago, the diaries were published this summer, The New York Times reported Sunday. The diaries contains references to several previously unknown documents referring to Wallenberg, including one recording the cremation of his body. They were published under the title “Notes From a Suitcase: Secret Diaries of the First KGB. 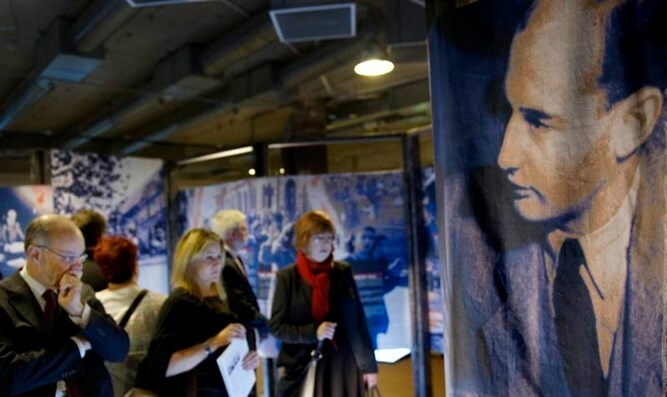 Chairman, Found Over 25 Years After His Death,” which went for sale in Russia in June. Serov died of a heart attack in 1990 at age 84. He is thought to have hidden the diaries around 1971. A 1991 joint Russian-Swedish effort to discover what happened to Wallenberg, which included archival research and interviews with retired state security employees, yielded no definitive conclusion when it ended in 2000. The investigation found that documents had been destroyed or altered to eliminate all traces of him. The diplomat’s parents both reportedly committed suicide in 1979 in despair over his disappearance. In November 2015, Wallenberg family members asked Swedish authorities to declare him dead.